The Harker Conservatory held its inaugural Summer Conservatory program in June and July, inviting young theater enthusiasts to grasp a unique opportunity to hone their craft and learn from top instructors and industry professionals. Laura Lang-Ree, Harker’s director of performing arts, had been exploring the idea of a summer program at Harker, as she knew firsthand the value of strong summer performing arts programs, both as a professional and a mother to three performing arts-loving kids. “There was a lot around that was really great, and there is no reason to compete with programs that are already doing a great service in the community,” she said. To this end, Lang-Ree began searching last summer for a specific niche that the future program would fill to enhance the selection of summer offerings without competing with them. 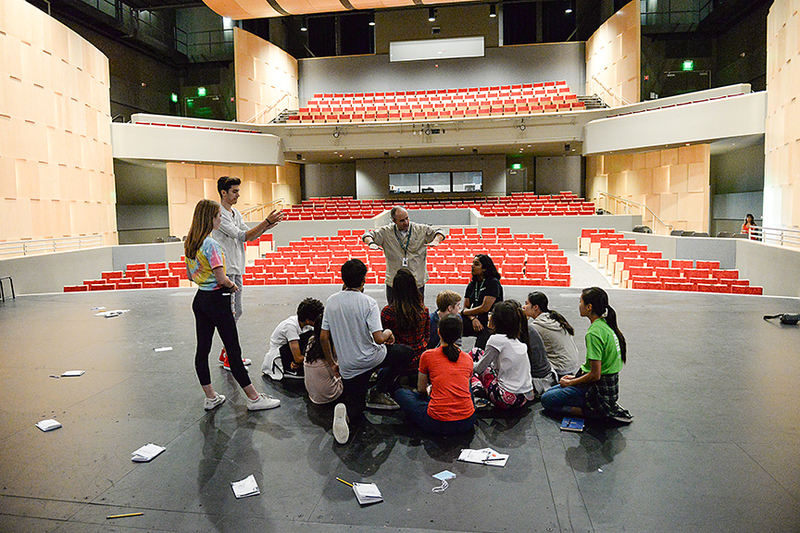 Students in grades 6-9 joined the Conservatory Presents course, designed for young theater lovers eager to build their chops. A more advanced course, called Conservatory Intensive, was available for grade 9-12 students by audition only. Morning classes – both required and elective – emphasized voice and movement, scene study, improvisation and other techniques. Students spent the afternoons rehearsing for one-act plays that were performed on the final day of the program. Performers were cast following auditions held at the beginning of the course. Among the directing staff, 2015 Harker Conservatory graduates Zoe Woehrmann and Madi Lang-Ree were brought on as co-directors for the showcase, and helped develop and teach acting classes in addition to their directorial duties. Because of their extensive conservatory experience (both were directors featured in the 2015 Student Directed Showcase), she and Madi were given considerable freedom when helping to create the Summer Conservatory curriculum along with Lang-Ree. Both alumnae also are studying theater in college, with Madi having directed a one-act play in her most recent semester at Chapman University, and Woehrmann, a rising senior at New York University, planning to take a play she wrote and directed to the Edinburgh Festival Fringe. “We worked together before camp actually started to design the curriculum and the daily schedule of classes we thought were important and how we were going to structure them and what we were going to teach within them,” Woerhmann said. They then worked in conjunction with Lang-Ree to come up with the best possible age-appropriate class curriculum for serious theater students.